How does making from the landscape connect us to the landscape? What are your thoughts on the relationship between art and nature? Wherein lies the beauty of foraging ? My love of foraging is both vast and orchestrally nuanced, in other words, that love is complex, at times intensely sweet, delicious, and harmoniously melodic, the rhythms of heart and nature beating in time; on other occasions it’s a chaotic jarring cacophony of anxieties, contradictions and obsessions. And yet that in itself is what I love; that the radical grounding of a life orientated towards a respect, reverence, awe and playful engagement with the wild realms, with the natural world, can hold the existential and ontological uncertainties of being. 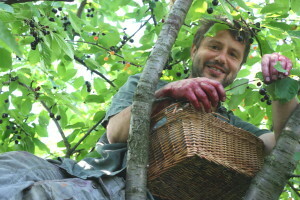 At its sensual, intellectual, emotional and dynamically flowing best, foraging offers a unique opportunity for deep connection both within and without.